I had the pleasure of being at the performance of The States at the Judith Wright Center in Brisbane this past October. The work was a multimedia collaboration between Erik Griswold (composer),Sarah Pierre (visual artist), and Craig Foltz(writer). Two of the three are ex-pat Americans living in Australia and New Zealand. The show was surreal and experimental with periods that were very intimate and accessible, a real treat. 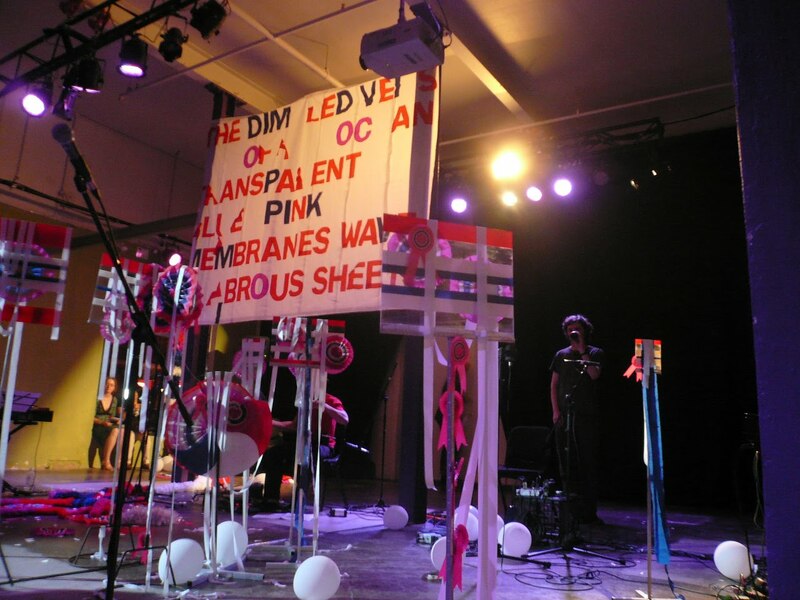 Visually piquing the curiosity, red, blue and white tissue paper creations streamed through the room, enormous odd ribbons of distinction were clustered on stands in the center, white balloons bounced on the floor and from the ceiling hung a banner with peeling letters. Projected images filled the window of the space with a banner of text running along the bottom, legible only from the outside. The looping images were of cornbread, fighter jets, a moose lamp, an LA roof top pool, colored flags against a blue sky and seemed set the stage for a performance focused on the act of observing or reminiscing rather than judging. The performers were setup in the middle of the room with the audience surrounding them and two large windows open to the crowded street. Many curious passers-by stopped in or just stood outside to peer in for a while. As you entered the space, Pierre handed out programs, a card and a pencil. Each card contained a quote and color coded instructions, such as pass this card to the person on your left, hang it to the wall or rate this quote. Throughout the performance Pierre sat stitching garland off to the corner, a subtle affect reminiscent of someone sitting on the porch, in a swing and listening to the radio. The audience seemed to follow her lead and relax into the experience. Foltz’s text appeared in spoke in fragments, looping and sprinkled thoughts through the piece. “In this part an ascending axis”. His words provided momentary snippets of thoughts and glimpses, like memories flashing by. Foltz lead the audience through the Dada-esque activities. Pending the color on which his spinning wheel landed, the audience read poetry, tore up their cards, or affixed their own writing to the walls. Another successful cross over between the performer and viewer was the final piece, The Party’s Over, during which Pierre deconstructed the installation and gathered all of the streamers,and ribbons together into a heap in the middle of the room. I found this show a lovely dream scape of sounds, color and words; a melting pot that decided not to melt too much. 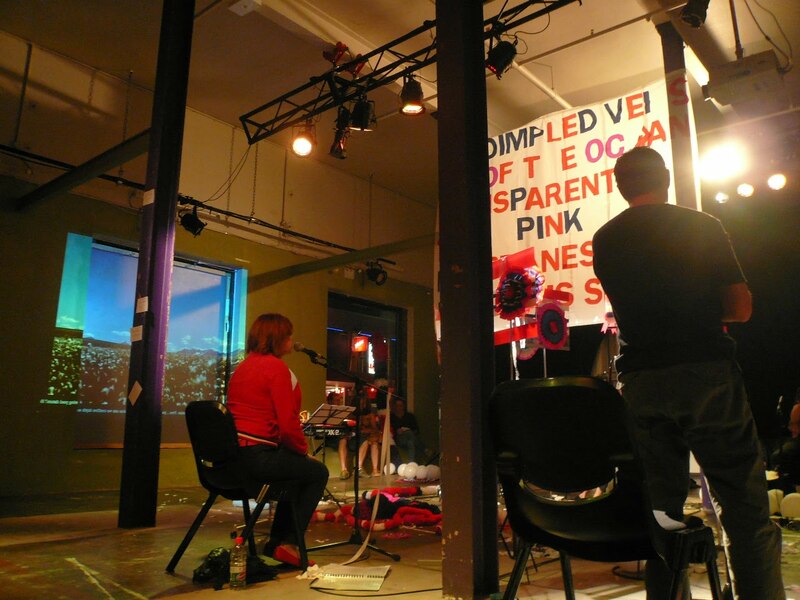 This entry was posted in collaborative project, performance on October 14, 2009 by kristindagostino.